*UPDATE 25th September 2013 22:00* This offer has now expired – 1,500 customers successfully redeemed the voucher, but if you missed out keep an eye on our blog as we’ll be running more soon. There’s nothing quite like a free breakfast is there? That’s why I’ve been working with our buyers and suppliers to give you guys a treat this weekend. For orders delivered by Sunday, we’re offering 1,500 followers over £20 worth of truly scrumptious breakfast material, including delicious Denhay bacon, Yeo Valley Organic milk and yoghurt, Hovis bread and muffins, Twinings tea and more. 2. Enter the voucher code VOU3174311379 at the Checkout (cannot be used with any other voucher). 3. The items in the Breakfast Bundle will be automatically added to the trolley for the first 1,500 people to enter this code and check out. This entry was posted in Freebies, Talking Ocado by Ocado. Bookmark the permalink. I tried to use this but it won’t let me use it with an existing voucher I’m using because my shopping arrived nearly 2 hours late this week! Hi Rebecca, unfortunately you can’t use multiple discount vouchers on the same order, this is stated in the offer Terms and Conditions. Sorry that you can’t take advantage of the offer this time, but keep your eyes peeled here on the blog and on Facebook, we run offers for social media fans quite regularly. It says voucher has expired, does that mean its already been used up? Hi Rachel – yes, the offer was very popular so we hit the limit of 1,500 within a couple of hours. Keep coming back to our blog to find out about upcoming offers soon. Ah not to worry Judith, we’re working with suppliers to bring you all freebies all the time, so there’ll be another one coming along before you know it. Thanks Ocado! What a lovely offer! I’ve entered the code and it’s worked a treat! One question: If an item from the freebie list is showing as ‘Out of Stock’ (example: the fig and honey yoghurts), will we still get that item? Hi Theresa, glad to hear you got the bundle! All items in the bundle are subject to availability. Hope you enjoy your breakfast on us this weekend. Thanks for replying so quickly! Looking forward to it! 7 of the items are listed as out of stock but were added to my order in the view order summary anyway. Will I be getting substitutes for those? Hi Igor, the offer is subject to availabilty, so it may be that due to popularity, some products included in the offer are no longer available. These will not be substituted. If you would like further assistance with this, please email ocado@ocado.com. Out of interest, for those that DID successfully apply the voucher code, are the free items distributed on a ‘first come, first served’ basis? i.e. 1st person to enter the code —> last person to enter the code? I fully appreciate that all products are subject to availability and I’m just grateful that you’ve even offered 1 product free! So, if I’ve checked out, does that mean whatever was IN STOCK at the time of checking out is officially mine? Or are these free products still subject to change until the day of delivery? amazing! thank you! this actually saved us a lot of money as lots of these items we were going to buy anyway! Thanks Ocado!!! Our pleasure Aga, what will you eat first? Good offer, polite drivers, good customer services too, well done and thanks. These offers on Facebook are good for customers and bring Ocado more custom, keep it up please. Thanks Tony, we’re super-chuffed to hear such lovely feedback. Hi Alison, that sounds strange – please contact our customer service team on ocado@ocado.com for more information or assistance. Hi, I placed my order an hour ago and wasn’t notified of any out of stock items. Viewing my order now though, I notice that 7 of 13 items from the bundle are actually unavailable but are still listed as part of the order. Will I get substitutes as a result or nothing at all? Also, I was wondering if it is possible to replace the Milk with a Milk substitute for dietary reasons? Hi Becky – we hit the redemption limit of 1,500 quite quickly, so unfortunately when you tried to check out using the code it had expired. The offer was extremely popular! Keep coming back to our blog for more offers soon and hopefully next time you’ll be able to take advantage of the offer. Only half of it added! Love Ocado and I’m always singing your praises, have had weekly deliveries non stop for 5 years but missing the bacon, coffee, brioche, fig and honey yoghurt and the orange juice! I am really annoyed by this offer. My delivery day is on a Monday and have a really tight budget. The breakfast offer was great. Why do I always miss out on these offers. Also I always get sent offer emails after my shopping has been delivered and the offer has always expired so I can’t take advantage if it, it’s so infuriating! I am a very upset, long standing user of Ocado. I have added the voucher but only a few thing have been added to the order not all of the items listed – can you help? This only showed on my Facebook page as being published just after 4pm so by the time I placed my order the offer had expired? As a regular shopeer with Ocado I always look out for these deals but find this a bit unfair. Sorry to hear that you’re unhappy Nikki; as you can imagine, this was a very popular offer, so we hit the redemption limit of 1,500 rather quickly. We’re working with suppliers to bring you guys new freebie offers all the time, so please try again next time. Sorry Lisa, it sounds like you didn’t quite get there with the voucher quick enough. We were limited to 1,500 breakfast bundles and they went really quickly. Don’t worry though, there will be more freebies on offer through our blog soon, so do try again next time. I have used the voucher, but not all of the items detailed in the offer are appearing in the trolley or once the order has been confirmed. In fact, only about half the items are showing. Will I get all the items in the offer or just the ones that show in my basket? Hi Kate, we hit the limit of 1,500 redemptions within a couple of hours, so the voucher has now expired. Completely expired. Takes the shine off, somehow. Hi Katie, the offer was extremely popular, so we’re sorry that you couldn’t take advantage of it this time. We’re working with suppliers to offer you guys new freebies all the time, so keep checking and we hope you’re able to take advantage of another offer soon. Hi Emma, thanks for your comment, we’ve hit the maximum number of redemptions for the offer now, so the voucher has now expired. Keep your eyes peeled for more offers here on our blog soon. This offer does not seem to work? I’ve just tried placing an order for Friday 27th but it says voucher gas expired? Hi Louise, we’ve hit the limit of 1,500 redemptions so the offer has now expired. This was tempting. Went through shopping process online to find voucher expired. I’m frustrated by this and will be shopping elsewhere even though I’d got as far as checking out, just because I’m annoyed. I now have a negative association with Ocado brand and Ocado marketing. Not sure that was your intent. Hi Ann, thanks for your comment. It’s a shame that you weren’t able to redeem the offer, which was limited to the first 1,500 redemptions as stated in the terms and conditions. 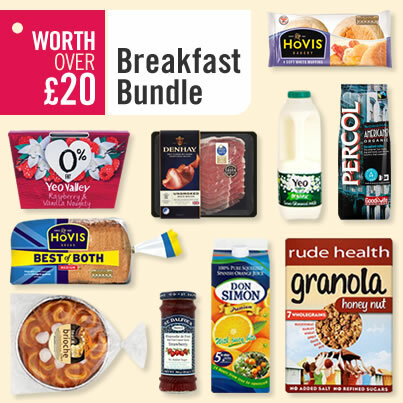 The breakfast bundle was really popular so we reached the limit quite quickly. We’re sorry to hear that you now have a negative association with us – if there’s anything we can do to help rectify this, please email our customer service team at ocado@ocado.com. Why haven’t you responded to my comment it was the first one left on here? Oops sorry Rebecca, looks like we missed that one, sorry. Got my Ocado order this morning, complete with the free breakfast bundle- tea, coffee, OJ, milk, bacon, jam, bread, muffins, yoghurts, granola and some lush looking brioche- thanks Ocado!!! Looks like its going to be a belt-busting weekend, lol!